Goals! What are your goals and your mission with your web site? Let's discuss that, then we can design a site to meet your needs. We can reconstruct an existing site, but sometime it's better to start from scratch. Or from pixel by pixel. Will you need a data base? Shopping cart? Are you trying to tell the world about yourself or your product or service? Once we know the goals, we can utilize our services to create your site. Your clients can have 24 hour, 7 day a week access to your business! From a simple design which gives your location, hours and phone number to in-depth information about your services and products, placing your business on the Internet is a must. At Atomic Web Katz we help you and your clients. We consider all aspects of your business and online needs and we will help you avoid the "don'ts" of web design and development. Just as with the first impressions clients receive when they enter a brick and mortar store, first impressions of your web site must be as positive - creating a "Wecome! and "Let's do business!" atmosphere. We will upload your site to a temporary viewing location for your approval, then ftp it to your provider after your approval and final payment is received. We will also submit your site to several of the major Search Engines if you wish. Please see the sample contract. Your contract will be customized for your site and needs. Please visit our Rates and Contracts page for more details. Need a professional Facebook page? We can create custom Facebook pages for your business. Don't underestimate the power of blogging! A quick way to get into the higher search engine rankings is to blog often. We can help you! Want a Personal Home Site on the Web and can't figure out the templates or html code? We can design and build your site or redesign it for you! You provide the imagination and we'll make it happen! We can help with backgrounds, graphics, flash and midis. Let's tell the world about you! We can also help you set up your blog! There are several free sites online for blogging, and we know the best two! Prices start at $75 per hour. Please visit our Rates and Contracts page for more details. 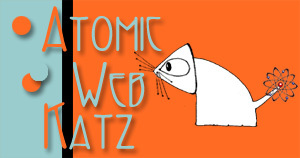 Please browse some of the web sites developed by Atomic Web Katz.